The landing of US Airways flight 1549 on New York’s Hudson River on January 15, 2009 captured worldwide attention and it remains a feel-good story. But every year there are aviation events that go unnoticed because actions of pilots, flight attendants and air traffic controllers prevented something bad from becoming awful. Since the goal of accident investigations is to find out what went wrong to prevent the next one, are there lessons to be learned from what went right? Safety experts say yes. I’ve put together a list of near-tragedies and asked people in the know what factors they believe contributed to a happy ending. Feel free to comment with your own. she could direct him back to the Kansas City airport for an emergency landing as quickly as possible. Brian McCusker told reporters he’d never been as scared as he was when a fire broke out his flight from Minneapolis to Regina, Saskatchewan. There were 72 passengers on the plane as smoke started billowing from a bathroom in back. Pilots Steven Peterka and Lee Cain put on oxygen masks and declared an emergency. While flight attendants tried to put out the fire, (one of them, Eder H. Rojas, would later be charged with starting the blaze) passengers fled the rear of the plane toward the front. The aircraft was flying at thirty-two thousand feet and the pilots realized they needed to get on the ground as quickly as possible. Capt. Peterka turned off the autopilot and banked the airplane hard in order to increase the descent rate. It took just eight minutes for the plane to make an emergency landing at the Fargo airport having come down at an astonishing 4,000 per minute more than twice the speed of a normal descent. Officials later said that a “delay in descending and landing could have resulted in the loss of all 79 souls on board the aircraft.” Fire in flight is always extremely serious as illustrated by the crash of Swissair flight 111 on September 2, 1998. In that accident, pilots first tried trouble shooting indications of smoke in the aircraft, a delay that might have contributed to the disaster. Two-hundred and twenty nine people died when the plane crashed into the sea. The thirty seven member New Jersey Devils hockey team was on board an MD-80 charter flight headed for Toronto. As the plane accelerated down the runway first officer, James Findley called, “Rotate” when the plane hit 127 knots. But Capt. Matt Klingsporn found he could not raise the nose of the airplane. Though he was beyond the speed at which a takeoff can safely be stopped, Capt. Klingsporn and Mr. Findley did just that. It was the right decision. The investigation showed that a jammed horizontal stabilizer made the plane unflyable. Findley credits training for helping the crew make the right decision with just a split second to react. "At that time, training took over," Findley told the Milwaukee Journal. "When you train, and you train, and you train, when something happens, you just react." 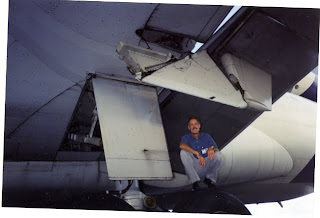 “There is no checklist for ‘flap comes off of aircraft’" Mark Abbott told me and he was not joking. That is precisely what happened to a Fed Ex MD-11 he was piloting with Capt. Jim Almlie. The men did not know that a wing flap had torn free of the wing, severing a hydrolic line and jamming the spoiler in the up position as the plane approached landing at Subic Bay in the Philippines. “We’re in a left bank I can’t control it,” Mr. Abbott said the captain told him. “ I was thinking, I must be in a dream I’m going to wake up. And it all happened in less than a second. The next thing I realize, this isn’t a dream.” For twenty minutes the men worked together, trying to figure out how to fly an airplane that wanted to roll topside down and get it to an airport where emergency equipment would be close by. “Right after it happened, he was so busy trying to get control of the aircraft," Mr. Abbott said of the captain, "he said, ‘You handle the diversion.’ He realized, I’m going to fly the aircraft, you figure out where we’re going to land.” Certainly the pilots of the Fed Ex flight were heeding the mantra, "aviate, navigate, communicate" as they worked as a team. In addition, a crews’ “knowledge of the aircraft and its systems,” has saved the day many times, said Ira Rimson a forensic engineer and air safety expert. Finally, no discussion of disasters averted would be complete without a nod to the role of luck. “Weather, if it’s good it definitely increases the chance of a positive ending,” Darren Gaines said, along with time of day, light and perhaps most importantly, a place to land.